I really love farmer's markets. Fortunately, we have quite a few good ones here in Las Vegas. One of the farmer's I particularly like that grows organic, seasonal, and flavorful fruits and veggies, had these beautiful asparagus bunches this past week. They were so unusually green and large, that I had to buy some. I couldn't wait to get home and make something with my newfound gem. I had so many ideas but decided to go for a soup, because I have been under the weather lately, and it seemed like the perfect food to consume when feeling sick. 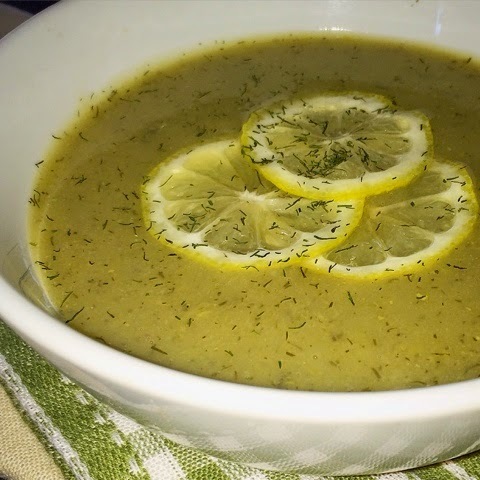 This soup took no time to make, and was so delicious! The lemon and dill go really well with the creaminess of the potatoes and asparagus blended together. It was perfect! In a large saucepan, heat up the oil and sauté the onions and celery under medium heat for 4-5 minutes until translucent. Add the rest of the ingredients and bring to boil under medium/high heat. Once boiling, reduce the temperature to medium/low, and simmer for 20-25 minutes until the potatoes are tender. Puree the soup in a blender and enjoy!